Jazz Band, Get Live Music for your best Cocktail Party! Inicio » Blog » Wedding music » Live Music for your Cocktail Party! Jazz it up! with a live Jazz Band. Of course, at a wedding, the most important part of the evening would be the fact that two people are pledging themselves to each other for the rest of their life or at a cocktail party where the most important part is mingling, pleasant conversations, frivolity and ensuring everyone is having a good time. But in all this, music plays a very crucial role. Not just at these events but so many others too. It sets the tone of the event. But, how do you make the music perfect? Louis Armstrong - "There is two kinds of music, the good & the bad. I play the good kind." How do you ensure the tone of the event is set right? For that, you need to answer what mood do you want the party to be set in? The food and drinks will be amazing of course, but none of it will be enjoyable if the ambience isn’t set right. You often hear about how the music was too loud that the guests couldn’t even speak to each other. So, keep all these small aspects in mind when you decided on the music. 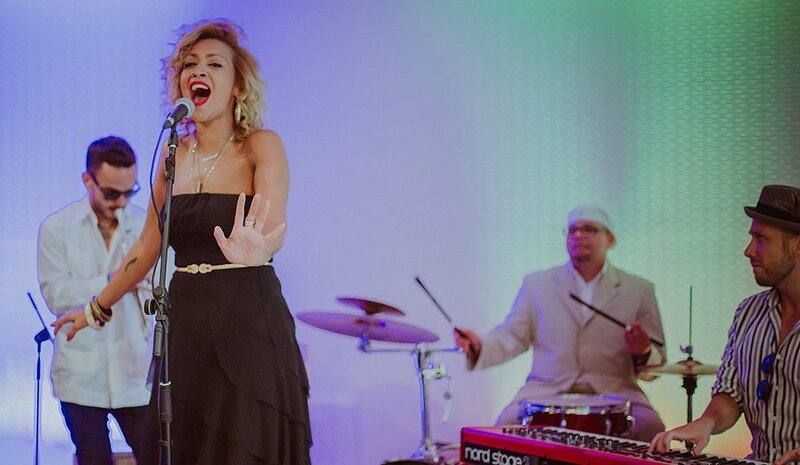 It’s a great idea to have a jazz band at your wedding, having a live jazz session and hiring a wedding singer actually may turn things up a notch. Giving them a list of your favourites ahead of time, and in the order you want them sung, will just make the night even more special. Undeniably, there are a lot of people who may not want that and may be looking for wedding cocktail music. They just want soothing tones in the background, allowing people to speak with each other, uninterrupted. Wedding Singer performance at Esferic Barcelona. Have a jazz band in the background or perhaps a wedding singer. It will make the event so much more different than ones that just have a DJ playing. You and your partner can customize a playlist. Select the songs that you’ll want played. Thus making the event a lot more personalised. Or if it is a cocktail party maybe ask your friends if there are any particular numbers that they want to listen to in particular and compile a list that way as well. Having live music at cocktail party stirs up excitement and a keen interest. You may not even know which song will be on next. It can stir up conversations about the music too. Bringing people to together is easy with music. Make new bonds, mend broken ones and help people relive memories and remind them of the good ol’ days. That’s why it’s important to choose the right music because you don’t want to end up stirring the wrong emotions. Did you like this article? We appreciate your time and we hope that we have helped you to decide if it is a good option or not to have live jazz band during the cocktail. Share it on social networks with the buttons below to reach more people, we also invite you to leave your comment. We hope you come back soon and we wish you a great day.